LG has been one of the major players in the mobile smartphone market ever since the early days. Today’s launch follows an unusual longer waiting time for the Korean company as it opted to skip on the usual MWC timeframe for the spring product launches, preferring to reveal the new flagship 2 months later. Over the past week LG has teased various characteristics of the G7 – in particular we knew in detail the specifications of the screen. Today we see the full device unveiled and are able to paint a full picture of LG’s new mainstream flagship device. As noted, the LG G7 comes a few months later than the usual spring refresh cycle. Last year LG opted to release the G6 at MWC, however this seemed to have come at a disadvantage for the phone as it came with an older generation Snapdragon 820 SoC. The G6 was still a successful phone – however it’s inarguable that it missed the very large improvements that came with the Snapdragon 835, particularly in regards to performance and battery life. In the first few months of availability of a new SoC there is fierce competition among vendors to try to get enough volume. Over the last few years Samsung and Xiaomi have always been able to secure the first batches of Snapdragon SoCs, and this year it seems to have been no different. LG’s decision to delay the G7 a couple of months is in my opinion a good choice as it takes advantage of the new generation SoC while also being able to attract more attention to itself without being overshadowed by the other Korean company. The G7 is powered by the latest Snapdragon 845 which comes with 4x Kryo 385 Gold/Cortex A75 derivatives at 2.8GHz and 4x Kryo 385 Silver/Cortex A55 derivates at 1.77GHz and a new Adreno 630 GPU at 710MHz. We already had an in-depth look at the new SoC in our Galaxy S9 review and were generally well impressed with Qualcomm’s silicon and I’m sure it’ll be a good cornerstone for the G7 as well. 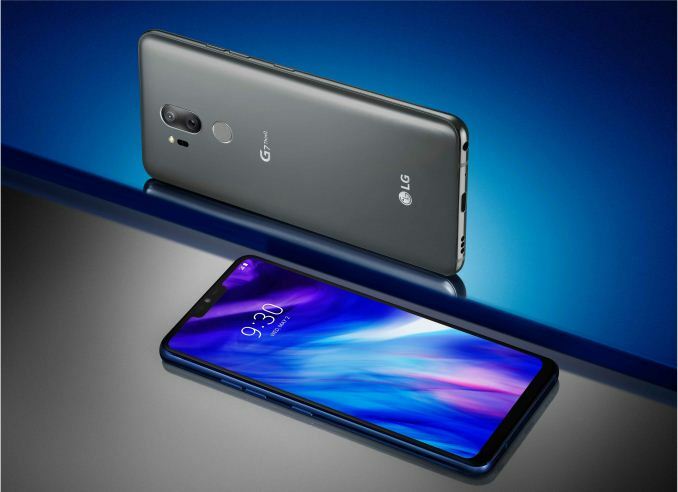 The device maintains a 4GB RAM and 64GB ROM configuration, much like the LG V30 and G6. One of the oddest changes for the G7 is the reduction of the battery size down to 3000mAh from 3300mAh on the G6. This comes at a surprise given that the phone hasn’t changed in terms of width or thickness and is actually 1g heavier than the G6. Still the jump from a Snapdragon 820 to the 845 should see an increase in battery life, regardless of the battery size reduction. The new screen of the G7 has made a lot of rounds in the news, in particular because, yes, it has a notch. Before talking about the notch let’s first address the screen itself. LG maintains an LCD screen for the G-series while it’s stated that the OLED panels are an option that for the moment will be reserved for the V-series. I never got around to writing a review on the V30, but one of the weakest points of the phone was the seemingly inconsistent quality of the screens. My V30 unit in particular had horrible colour variations and banding, while Ian’s unit seemed better and the V30s also seemed better, but all units still lagging behind Samsung’s quality in terms of uniformity. LG’s choice to keep to an LCD on the G7 is in my opinion the safer route – particularly given that the G6 panel was one of the best in recent memory. The G7’s screen increases in size to 6.09” diameter, however the new 3120x1440 screen comes with a 19.5:9 aspect ratio. Essentially what this means that the screen is no wider than on the G6, and the increased size is solely due to the increased area at the top of the phone. Indeed, the G7 maintains the same 7.9mm thickness and 71.9mm width of the G7, while increasing its height by 4.3mm to a total of 153.2mm. 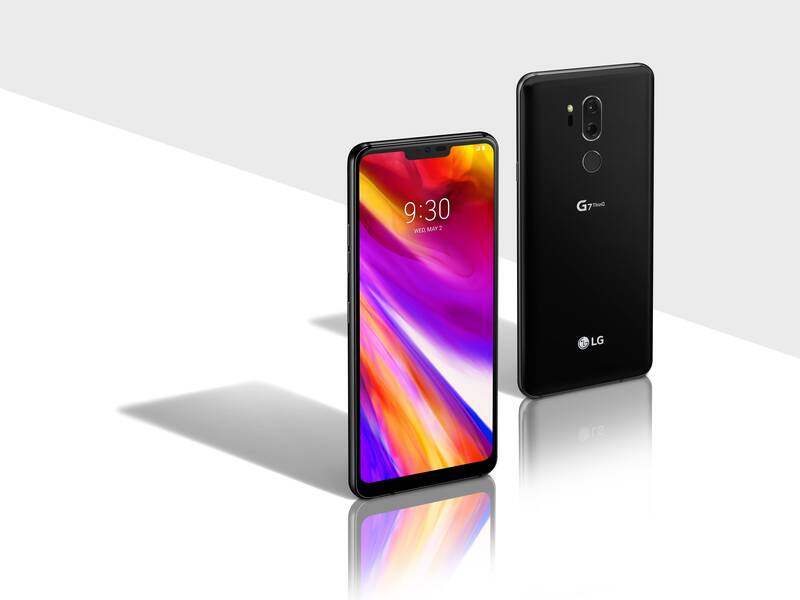 Getting back to the notch; LG succumbed to market pressure to include it into the G7, but at least has been able to implement it in a seemingly seamless way. LG follows Huawei’s lead in terms of giving the user a variety of software option in regards to the looks of the notification area. The notch, which houses the front camera, earpiece and sensors is a little over a third of the notification area width. The OS allows to black out the notification area and the front of the phone comes in black in all colour variations. 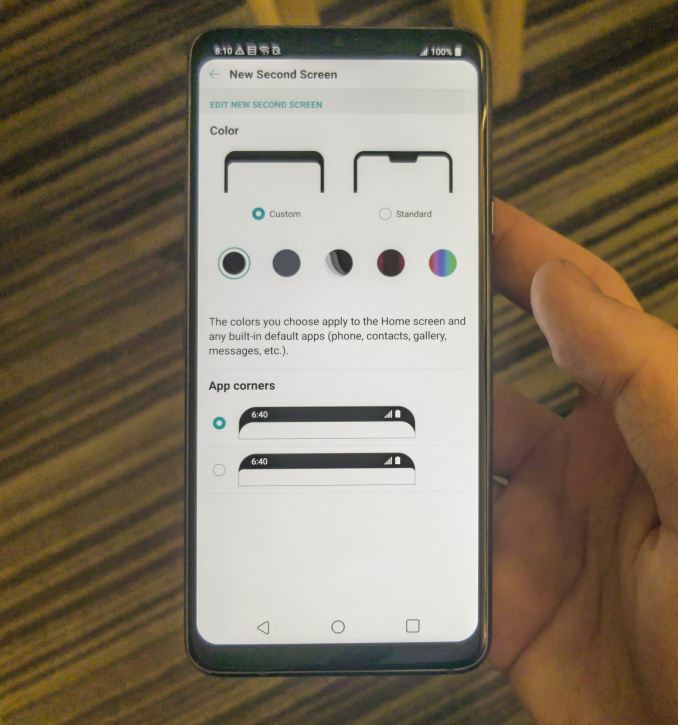 Again, Huawei was the first to implement such functionality, but LG expands on it by offering more colour options for the notification area as well as also an option between large and small radius rounded corners. 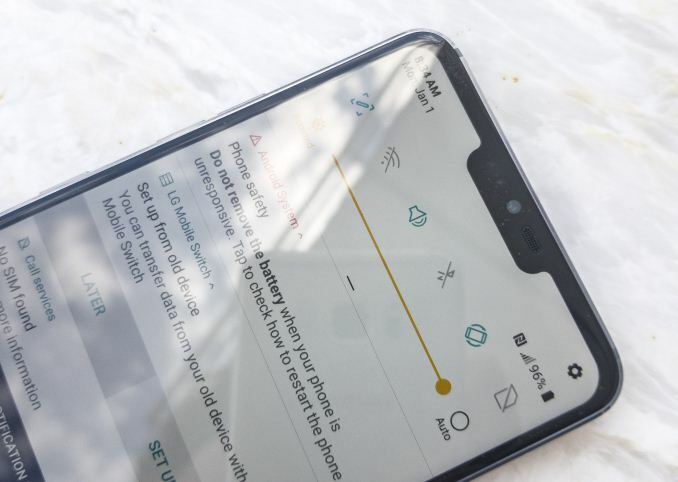 The regular Huawei P20 showed that hiding the notch in this was can be hit-and-miss on an LCD screen as it’s not able to provide a seamless transition from the bezel to the blacked out notification area. For the G7 to pull this off, it’ll require a lot better contrast ratio on its LCD panel. Continuing on the screen, LG makes some great claims in terms of brightness and power efficiency. The screen is claimed to reach up to 1000nits, all while improving power efficiency by 35%. As I theorised in the pipeline article from a few days ago, the only way for LG to achieve this would be to adopt an RGBW subpixel configuration, and that's indeed what they did. As far as I'm aware this is also one of the first 1440p RGBW panels in a smartphone so it will be very interesting to see the results in terms of sharpness. The question here is if we're looking at a proper grid-like RGBW with 4 subpixels per logical pixel or a more exotic arrangement, which we haven't been able confirm yet as time of writing. The 35% less power consumption claim alone is very significant and might be one of the reasons why LG allowed itself to reduce the battery size of the phone. The screen has a wide native gamut of up to Rec2020 (DCI-P3) – the distinguishing factor here is that it’s also a 10-bit display, making this alongside the Sony XZ2 one of the first smartphones to come with the feature. Naturally it’s also capable of HDR playback, enabled through the 1000nits peak brightness. The big question here for me is still how LG is going to handle colour management. LG showed that it’s still using colour modes in the settings menu, if Android Colour Management is fully supported or if it’s overridden is something we haven’t been able to confirm yet. On the rear of the phone we see some more significant rearrangement in the camera housing design. LG has scrapped the horizontal dual-camera layout for a vertical layout. The two cameras are also much closer together now as the laser-autofocus and flash have moved to one side of the cameras. The fingerprint sensor no longer acts as the power button of the phone, which has been relegated to the right side of the phone. The camera system itself saw changes as well. The main shooter remained similar as the one found on the V30 – a 16MP sensor with F/1.6 aperture. The G7 also uses the same sensor as the V30 - the Sony IMX351 so all in all we’re looking at software improvements rather than drastic new hardware changes. One of the improvements on the software side here are the adoption of the “Bright Mode” camera mode which allows for 2x2 pixel binning at a quarter resolution. The resulting photos allow up to 4x the brightness over the G6. In our extensive camera comparison in the Galaxy S9 review the V30 ended up as consistently one of the best shooters all-round so all LG needs to do for the G7 is to adapt the software to take advantage of the Snapdragon 845’s new image processing capabilities and I’m sure we’ll be seeing some top-tier results. While the main camera hardware didn’t see large changes, the wide angle shooter saw significant upgrades. Compared to the V30 and G6, the new sensor increases its resolution to 16MP and while maintains the V30’s F/1.9 lens aperture (The G6 had an F/2.4 lens). LG chose to reduce the field of view from 120° down to 107° in order to reduce distortions and chromatic aberrations at the edges of the frame. LG integrated a new portrait mode in which one of the sensors acts as a dedicated depth sensor. Portrait mode captures allow for selective focus after-the-fact. While there are many vendors who are dropping the headphone jack in favour of USB-C audio, LG doubles down on the 3.5mm jack audio quality and continues its trademark usage of “Quad DAC” audio system. The G7’s audio is powered by an ESS SABRE ES9218 audio SoC. LG claims this allows for clearer sound, reducing distortions and ambient noise up to 50%. I think the bigger story here is that we need to explicitly applaud LG for being courageous enough to continue with the 3.5mm jack – as ridiculous as that is. I’ve been very disappointed with Huawei and Xiaomi’s removals of the headphone jack as I still strongly think it’s very anti-consumer-choice and brings little to no benefits. Another significant change for the G7 is the speaker system. While externally this would be hard to distinguish, the G7’s speaker sees massive upgrades. The speaker itself is 39% bigger than on the G6 – but the most intriguing design change is the resonance chamber design. Instead of the speaker having its own little resonance chamber housing, the G7 speaker uses the whole interior of the phone’s body as a resonance chamber. LG quotes a figure of 8 cubic centimetres for the G7 versus only 0.46cc for the V30 and 0.32cc for the G6. At low midrange frequencies of 500Hz this allows the G7 to be 3x (9dB) louder than the G6 and 2x (6dB) the S8. The G7, like the V30 and G6 before it, continues to be IP68 water and dust resistant. 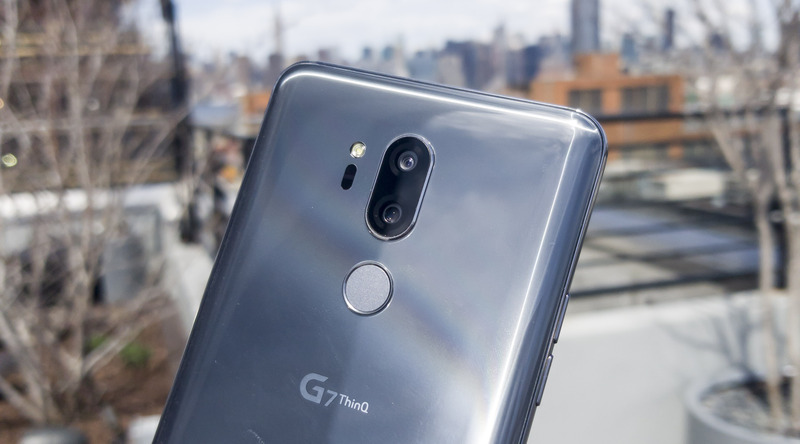 LG brands the G7 as the ThinQ G7 – and this is all due to the marketing attempt to promote AI features. 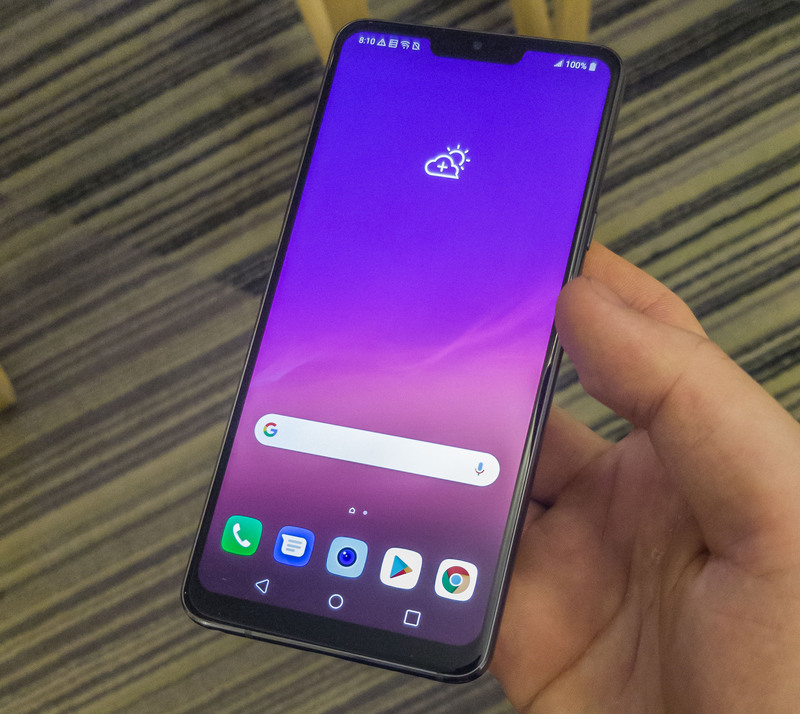 We’ve covered LG’s ThinQ features on the V30s in details in a hands-on article. Unfortunately LG AI features remain very gimmicky and far less practical than say, Huawei’s. LG even went as far to introduce a new button on the side of the phone underneath the volume buttons which is used for AI features. LG refrained from creating a new assistant, and instead bases its implementation on the Google Assistant. Holding the “AI Hot Key” as it’s called, allows for direct input to the Google Assistant without the necessary “Hello Google” wakeup phrase. LG looking towards feedback from users into expanding the functionality of the button, so it could see more varied use in the future through firmware updates. The build-quality of the phone feels very high quality and solid. There’s not much to say about the design as it seems very good and streamlined. 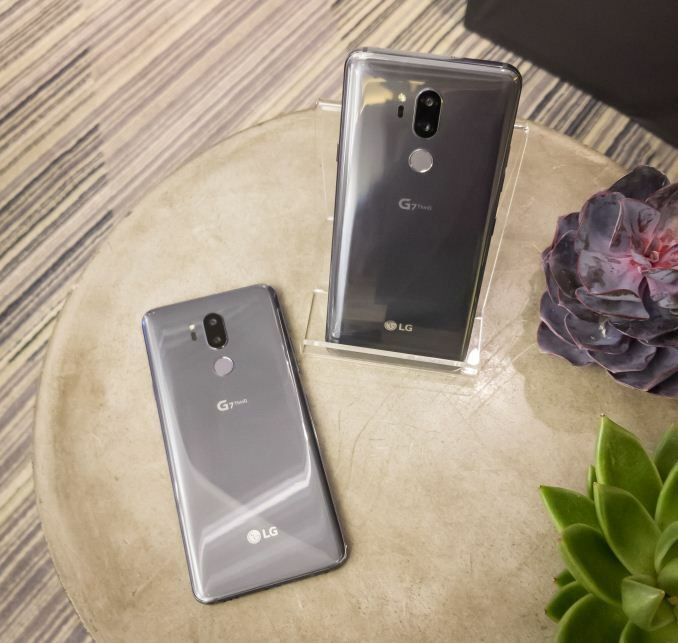 During MWC LG made a point that the industrial design of smartphones is getting harder and harder as vendors are all converging towards what is basically the “essence” of a phone – a full-screen bezel-less device. I think we’re not too far away from this total design consolidation and the only real thing phone manufacturers can do alongside that goal is to make sure the device ergonomics become optimal. 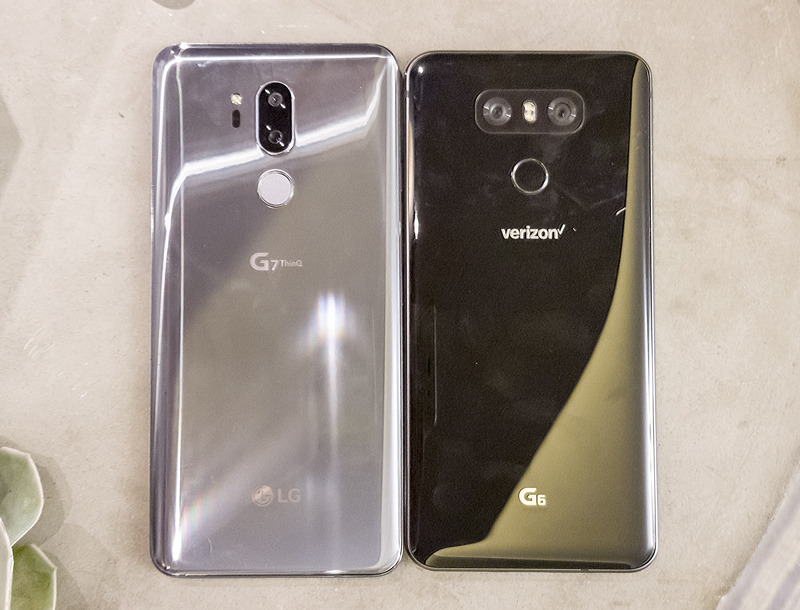 This essentially means rounded corners and side-bezels, on which the G7 improves compared to the G6. All in all, LG made incremental updates to the G-series and the G7 seems to be a well-rounded product. The biggest open-question for me will be the screen quality and characteristics as that’s where LG made the biggest changes. Battery life is also something that should be a deciding factor for the G7, as we’ve seen major changes in the three most impacting factors (SoC, battery size, screen efficiency). Availability will be rolling out in various markets over the coming few days, and pricing will be will be announced locally closer to the time of availability. I think it's sad that I'm seeing so much abuse directed towards LG today. Everything they are doing makes perfect sense. The phone is thinner and lighter than the Samsung equivalent. It doesn't have curved edges, so it doesn't suffer from poor quality visuals at the edge either. I'll take the flat LG LCD over the terrible curved OLED even though I'd prefer a flat Samsung OLED. Makes it easier to put in a case and more comfortable to hold with a case on it. I hope you can still use the fingerprint reader as a power button, that was my favorite feature. The side power button is hard to press in a case, but since the case never covers the fingerprint reader, again I thought that was superior. LCD panels generally have worse uniformity the larger they are. No problem with a phone screen. I want an OLED TV, for a phone it matters little. I'll take the outdoor brightness and low battery usage and consistent quality along with the default 1440p over the Samsung 1080p one. Again a dedicated button for the Google assistant is actually useful over a Bixby button. And since LG isn't pushing the assistant, I'm sure they'd be open to allowing a remap unlike Samsung as well who needs Bixby to succeed. The article states you can't use the fingerprint sensor as a power button. At best they'll implement it as a software feature which is off limited use in my opinion; however it sounds like there's no physical actuation which is what I'd consider a button. And the abuse directed towards LG is very valid. They abuse their customer time and time again. Very few people go back to owning LG devices. Some will try again and then swear off them. Their bootlooping, QA and software support problems all contribute to them becoming this mostly irrelevant player. It's not something that came out of nowhere. I had an LG G2. That's arguably the best device LG released in the G series. I have no interest in going back to owning an LG device despite that. Despite the fact that I avoided the bootlooping. I replaced my ageing Galaxy S5 with an LG V20. The only feature I cared about was that, like the S5, the V20 had a removable battery. It seems my sarcasm didn't translate well. I resigned my office-job and now I am getting paid £64 hourly. How? I work over internet! My old work was making me miserable, so I was forced to try something different, two years after...I can say my life is changed-completely for the better!